9193T-KS-DST is rated 4.7 out of 5 by 10. 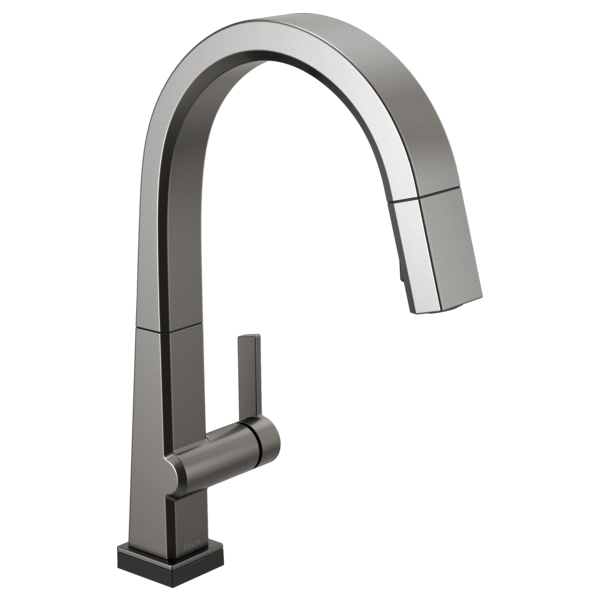 Rated 3 out of 5 by Meglette from Great faucet-except Purchased late September. Faucet was awesome until about 3 weeks ago. I had read a couple of reviews saying it began to have a mind of its own, now my same experience. If faucet is turned off, it will not work when turned on unless you tap it several times. It will intermittently just turn the water on when no one is at the sink. I do love the feature of auto turn off after 4 minutes, but it sometimes will not turn back on when tapped. Must be turned off at the handle, turned back on and tapped again...Very disappointed after spending $850 for a faucet that should work perfectly. Have been advised to purchase the optional AC adapter instead of using batteries, however this would be another $50. I am frustrated and at a loss as to what to do. Very, very disappointed in Delta for this" high end faucet " not working as it should. Rated 5 out of 5 by zrenee5 from The faucet is easy and convenient to use I like the idea of easy and convenient, just a touch with any part of my body, the water will be running out and that gave me a lot of time while cooking. Really easy to use. Rated 5 out of 5 by waynemartin19916 from Delta's Most Impressive Faucet Yet!! 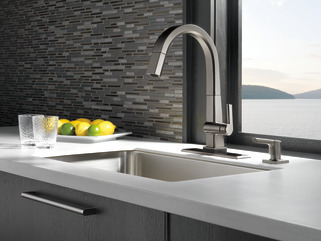 I have one word for this kitchen faucet from Delta....WOW!! 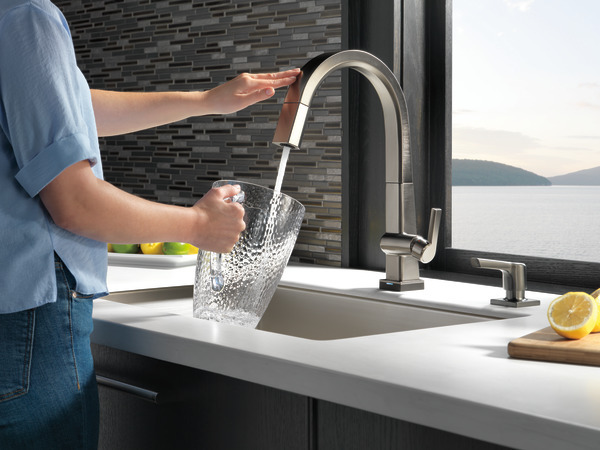 Delta's new Pivotal Single Handle Pull Down Kitchen Faucet with Touch2O Technology (9193T-DST) is most impressive, to say the least! 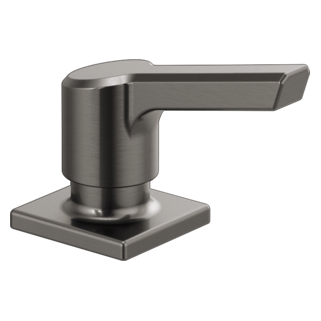 First and foremost, the quality and performance of this faucet is outstanding! Furthermore, the technology behind this kitchen faucet has made it possible for the kitchen faucet I've always wanted to finally exist. 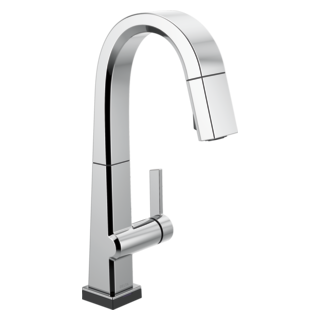 From the hands free usage option to the hot & cold water temp indicator lights, this kitchen faucet from Delta far exceeded my expectations! 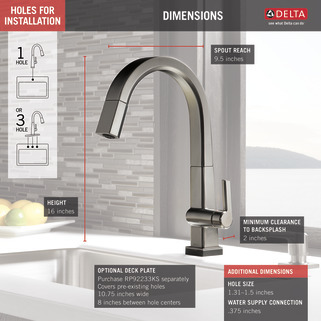 In addition to that, the nozzle/sprayer pulls down from the faucet for your convenience or you have the option to leave in place thanks to Delta's 'MagnaTite Docking' technology which provides a very secure placement and hold feature, as well as preventing loosening in the future. 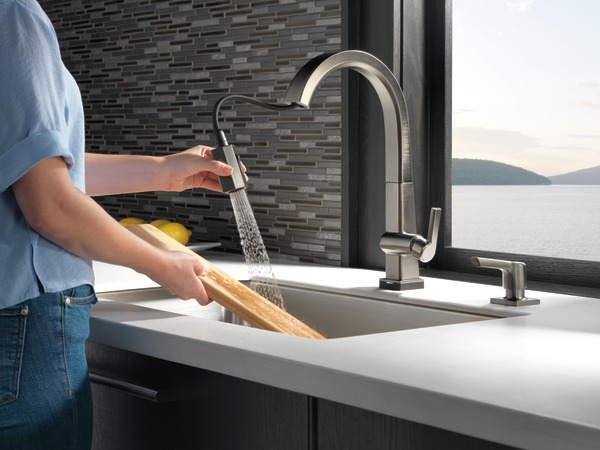 If you're looking for a kitchen faucet that works exceptionally well and comes equipped with all the bells & whistles, then you don't want to pass this one up! 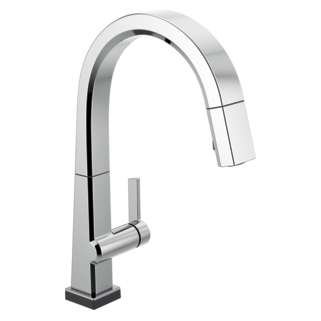 Rated 5 out of 5 by cricket20123 from The Ultimate of Ultimate Kitchen Faucets In my opinion, Delta's new Pivotal Single Handle Pull Down Kitchen Faucet w/Touch2O Technology is the ultimate of ultimate kitchen faucets. In fact, I'm surprised it can't clean the dishes by itself to be honest because it does just about everything else I can think of in regards to what I would want in a kitchen faucet. 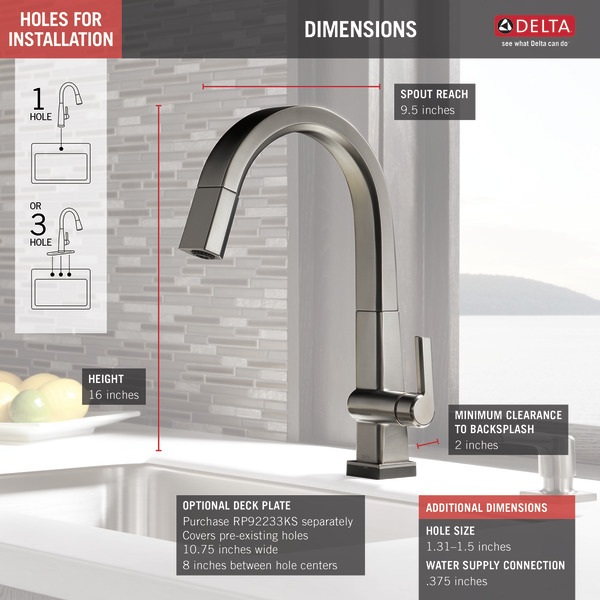 Delta has manufactured a faucet that is ingenious, innovative, & most impressive! The installation was completed with ease and without incident, not to mention that it worked like a charm from the first try! This faucet came with just about everything you needed for the install right down to the batteries that power the wonderful technology behind it! There's so many features with this faucet that I love, so it's very difficult to choose a favorite. With that being said, I would have to say the hands free touch is fabulous, as well as the water temperature indicator light to name just a couple! This faucet performs amazingly & it truly doesn't get any better than this! Rated 5 out of 5 by Lumica783 from Excellent faucet! Installation of Pivotal Single Handle Pull Down Kitchen Faucet with Touch2O Technology 9193T-DST was very easy. It took about 40 minutes to install. The faucet works excellent. Made the whole kitchen "POP!". The touch feature is very convenient, especially when you have dirty hands. I am completely satisfied. I recommend this product to everyone. Thank You Home Tester Club. 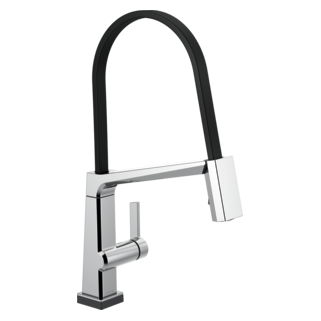 Rated 4 out of 5 by DivaMom5 from Convenient This is a stylish faucet and I like the convenience of having the sprayer attached and it's easy to use when your hands are dirty . I was disappointed in the color and the spots on there when I received it. Rated 5 out of 5 by Maemae774 from SUPREME QUALITY! 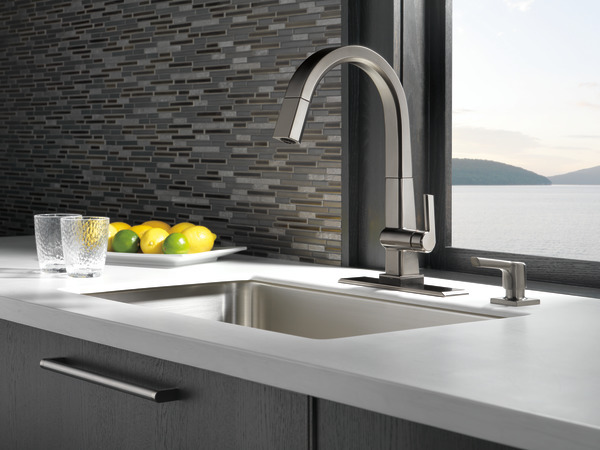 This is the best kitchen faucet we’ve ever had. We love the Touch20 Technology. It all in one everything faucet. We love how the head comes out so you can spray where you need it. It’s very up to date with technology. Delta has been a household fixture stsmple in our family as well as extended family. They make the best products with supreme quality that lasts for generations. 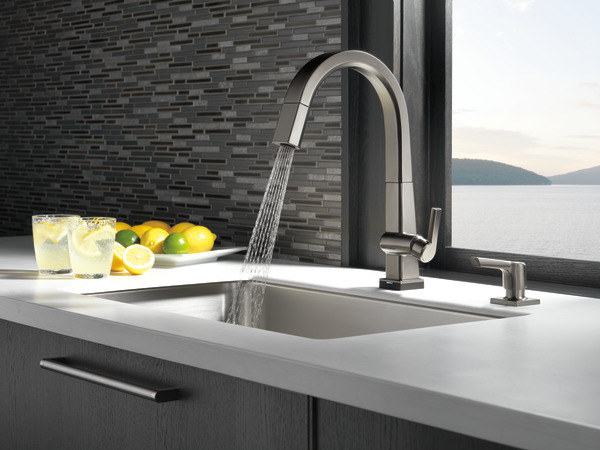 We definitely recommend this faucet. Can the touch feature be temporarily deactivated? How far can the nozzle be pulled on this model? When will the Pivotal Kitchen Faucet be available for purchase?